If you asked somebody who wasn’t a film-buff to name a movie director, chances are the first name they’d say would be ‘Steven Spielberg.’ Now, when he made movies like Jaws, Raiders Of The Lost Ark, ET, and Jurassic Park, it certainly seemed like Spielberg could do no wrong. But it seems that in recent years, he hasn’t done a fantasy adventure (Okay, The Adventures Of Tintin was amazing, but possibly the last great Spielberg movie in my opinion.) What’s he directed since? War Horse. Lincoln. And Bridge Of Spies. In short, he’s doing movies to try and get himself a third Oscar. From my humble opinion, War Horse was okay, but Lincoln was very dull. And Bridge Of Spies follows suit. The Spielberg Whimsy we might remember from his earlier work seems to have disappeared, as the last three movies he’s made seem like nothing more than typical Oscar bait. 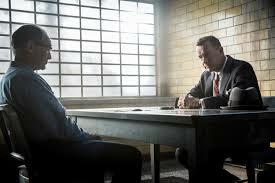 Regarding Bridge Of Spies, the film is about as basic as an Oscar bait movie can get. And it’s not even that bad of a movie. It’s decent enough, and there are one or two good scenes (particularly the climax). But there’s nothing in here that hasn’t been done before. While I initially thought Thomas Newman’s musical composition was a sure thing for a nomination, the score is extremely subdued and very seldom plays at all. Perhaps the one saving grace from this film is the cinematography. But unlike Tree Of Life or Ida where the cinematography is so bold that the story falls by the wayside, here the cinematography is just strong enough to make you wish that the rest of the movie could live up to it. Tom Hanks is his usual likable self, but he really doesn’t do anything here that he hasn’t done in all his other performances. As other critics have noted, Mark Rylance is the MVP of the cast, but even then, he doesn’t do anything that extraordinary. I could see him getting Oscar recognition, but he definitely doesn’t crack my top five. This film seems like something that was made to win Oscars with really no other goal in mind. If you like it, fair enough, I won’t hold it against you. But I think it would be a shame to see this movie get major Oscar nominations while there are so much other movies this year that deserve better.